Posted on April 1st, by Dr Rob Yeung . Look at the job advert or job description to work out the kinds of skills that the job is most likely to require. For example, I worked with a hospital administrator recently and we together identified that the top skills she would be asked to talk about included ‘patient care’, ‘organisational skills’, ‘building positive working relationships with colleagues’ and ‘understanding medical rules and regulations’. I suggest writing down at least bullet points describing situations in which you used the various key skills that each employer desires. So if you think that an employer is looking for ‘problem solving’ skills, then try to think back to a specific situation in which you spotted and then solved a problem. What did you do? And what was the result? For more advice on constructing your interview examples, I shot a video on how to give good examples in interviews, so take a look at that. I recommend to clients that they should set up their smart phones at eye level (e.g. put it on a shelf) and then record themselves talking. I think this is a really important step in preparing for interviews. Writing down a handful of stories isn’t of much use if you can’t be certain that you can say them out loud with confidence. So imagine that an interviewer has asked you a question and then try to answer it. For instance, imagine an employer asking you a hypothetical question such as “How would you rate your organisational skills?” You could answer by saying something like: “I’ve been told I have good organisational skills. For example, …” and then go on to give a specific example of when you organised a project successfully. Most people don’t like to listen to themselves – let alone watch themselves. One solution would be to work with a knowledgeable friend (i.e. someone in a managerial position who interviews and hires people) or a coach. But you can get better on your own by watching yourself too. So listen to what you said. Compare what you actually said on video to what you ideally wanted to say (from the bullet points you wrote down from step 2). 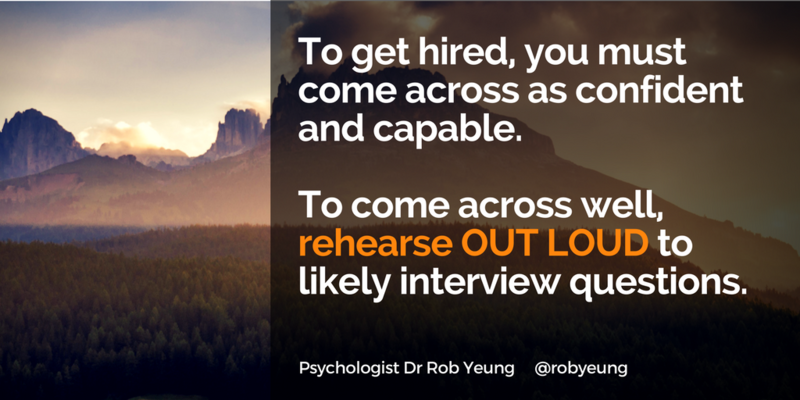 Keep rehearsing out loud until you feel that you are getting across all of the bullet points that you would want to tell an interviewer. 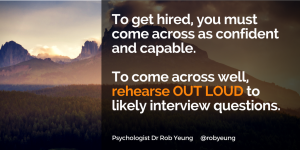 When you are certain that you are getting across all of the facts (the bullet points from step 2) that you want to tell an interviewer, you can begin to think about your body language and tone of voice. So begin to watch your use of your hands. Are your hands hanging limply in your lap – or are you moving them around to convey your enthusiasm for your work? Is your face cold and expressionless – or are you smiling appropriately to create a feeling of warmth and likeability? To what extent are you using your tone of voice and pacing to inject energy and appropriate humour into your answers? This fifth step can be quite tricky to do by yourself, so try to show your videos to a knowledgeable person (again, someone who has interviewed and hired people) to get constructive criticism on how you come across and how you could make a better impression. It doesn’t matter how good a candidate you are on paper unless you can build chemistry with an interviewer and demonstrate visible enthusiasm. However, the good news is that putting in just a handful of hours into these five steps can make a huge difference to your chances of landing your next job.